Radio stations and broadcasters can use our free Cirrus® Console to get started streaming instantly. You simply install, insert your call letters and authorization token we provide you, and everything is automatically configured instantly. No fooling around with entering information... it's all done for you within a few seconds. 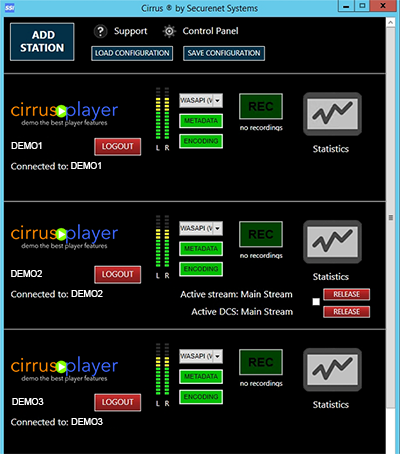 If you have more than one station, you can run as many instances of the Cirrus® Console as the machine/sound cards/ports will allow -- called the Cirrus® Multi-stack. This enables you to use one machine for multiple streams. Once you're streaming, you have a status window that is displayed in real-time showing you live statistics for DCS, encoder, FTP, and listeners. An awesome feature that is available when you are using our Cirrus® Console is the auto recording feature that allows you to schedule times to record your live stream and save it to your desktop and automatically upload it to your player's on-demand section. If you would like to start using our Cirrus® Console, please let us know!